Ghana's judicial council is to start an inquiry into corruption in the judiciary after a two-year investigation by a top journalist. Anas Aremeyaw Anas's investigation alleges that 34 judges have taken bribes and extorted money. He says he has nearly 500 hours of video evidence on tape, which have been handed over to the chief justice. The attorney-general has granted the journalist immunity under the whistle-blower act to pursue the story. 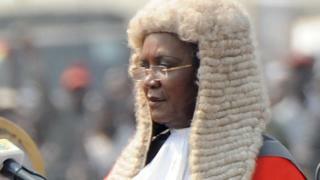 Chief justice Georgina Theodora Wood has summoned the 12 high court judges and 22 lower court justices implicated in Mr Anas's investigation, which has yet to be broadcast, to appear before the judicial council on Thursday. None of the judges implicated have so far commented on the allegations. The BBC's Sammy Darko in Accra says during his investigation Mr Anas, who is also a lawyer, approached the judges offering bribes if they agreed to set his purported clients free. In some instances, he pretended to be a litigant and offered bribes. Deputy Attorney-General Dominic Ayine confirmed to the BBC that Mr Anas was granted immunity two weeks ago. The journalist then followed a constitutional process to ensure that all the judges he named would be officially investigated by petitioning both the president and chief justice, our correspondent says. Allegations of corruption in the judiciary are not new in Ghana - but it has been difficult to provide hard evidence to the judicial council, he says. Ace Ankomah, from one of Ghana's biggest law firms Bentsi-Enchill, Letsa and Ankomah, told the BBC the investigation was a good opportunity to root out corruption. "Corruption is like a cancer. You treat a cancer with chemotherapy. Tomorrow the judges are being called to face disciplinary committees. That is what gives me confidence, that things can be fixed."